Aims To report the rate of intraocular pressure (IOP) elevation associated with repeated intravitreal injections of antivascular endothelial growth factor (VEGF) agents and to determine if a pre-existing diagnosis of glaucoma is a risk factor for this phenomenon. Methods The charts of 215 eyes undergoing intravitreal injection with anti-VEGF agents for wet age-related macular degeneration (AMD) were retrospectively examined with respect to frequency of injections, number of injections and changes in IOP. Data were analysed independently for two groups (1) pre-existing glaucoma and (2) no history of glaucoma. Results Of the 215 eyes receiving injections with bevacizumab and/or ranibizumab, 6% (n=13) had sustained IOP elevation requiring medical or laser interventions. Of the eyes receiving only bevacizumab, 9.9% (10/101) had sustained elevated IOP, while 3.1% (3/96) of eyes receiving only ranibizumab experienced increases (p=0.049). Patients with pre-existing glaucoma experienced higher rates of elevated IOP when compared with patients without pre-existing glaucoma (33% vs 3.1% respectively; p<0.001). The glaucoma subgroup had a lower median number of injections (6; interquartile range 5–10) compared with the non-glaucoma group (9.5; interquartile range 6–13.7; p=0.031). Conclusions The incidence of sustained elevated IOP in patients receiving intravitreal anti-VEGF injections is significant. Additionally, these data suggest the possibility of a heightened risk for further elevation of IOP in patients with pre-existing glaucoma who receive either bevacizumab or ranibizumab. Prospective studies are needed to verify these results and better understand the implications of these findings. In terms of local adverse event (AE) safety profiles, both ranibizumab and bevacizumab are considered safe,7–10 although there is a paucity of randomised, prospective trials of intravitreal bevacizumab. Recently, there have been case reports published documenting sustained IOP elevation after intravitreal bevacizumab and ranibizumab.11–14 To our knowledge, no large-scale study has been published which specifically examines the rate of persistent changes in IOP with intravitreal bevacizumab injections, though a recent abstract report of 512 eyes found sustained IOP elevation in 11.9% of eyes receiving bevacizumab15; nor, to our knowledge are there any studies that compared the rate of sustained IOP changes in a matched populations receiving either ranibizumab or bevacizumab. Additionally, we did not find any studies that evaluated the risk of IOP elevation in patients with pre-existing glaucoma undergoing intravitreal anti-VEGF injections for concurrent AMD. In this study, we examine whether intravitreal bevacizumab or ranibizumab has an association with elevated IOP, if the rate of IOP change is comparable between similar populations receiving intravitreal bevacizumab versus ranibizumab and whether a specific interval between injections or total number of injections could be identified that increases the risk of IOP elevation. We also examine whether existing glaucoma is an independent risk factor for IOP elevation after treatment with intravitreal anti-VEGF agent. Patients with AMD who received single or multiple injections of anti-VEGF agents, both bevacizumab (1.25 mg/0.05 ml) and ranibizumab (0.5 mg/0.05 ml), were retrospectively identified from two large retina centres in the Denver area. Injections occurred between January 2006 and October 2009, with some patients undergoing serial injections over a period greater than 3 years. All injections were performed in the office after topical anaesthesia using proparacaine hydrochloride 0.5% as well as instillation of a fourth-generation fluoroquinolone and one drop of 5% povidone iodine. The injections were all done using an infratemporal approach at a distance of 3.5–4.0 mm away from the limbus. For each patient, basic demographic information as well as injection frequency, total number of injections, at least two IOP readings predating injections and IOP prior to each injection were recorded. Follow-up IOP measurements were performed at subsequent intravitreal injection visits, and as such, the mean follow-up time after injection is equivalent to the interval between injection, or injection frequency. Additionally, glaucoma and ocular hypertension status, as well as medication regimen, prior to beginning injections, were recorded and analysed. Presence of glaucoma or ocular hypertension was verified by reviewing existing medical records dated prior to patients receiving their first injection of anti-VEGF agents. Criteria used to define glaucoma or ocular hypertension (OHT) included the following: history of IOP greater than 21 mm Hg leading to formal diagnosis of OHT by the treating physician, record of increased cupping to the nerve consistent with and leading to a formal diagnosis of glaucoma as noted by the treating physician, history of abnormal visual-field testing consistent with glaucoma, and history of treatment with topical glaucoma therapy and/or previous documented history of glaucoma or OHT by a glaucoma specialist or treating ophthalmologist within the medical record. All IOP measurements were recorded using Goldmann tonometry. Sustained IOP elevation was defined as an IOP ≥22 mm Hg lasting ≥30 days, recorded on at least two separate visits and a change from baseline of >6 mm Hg. Transient IOP elevation was defined using the above IOP parameters, but lasting <30 days without need for medical or surgical treatment. The IOP value of ≥22 mm Hg was chosen to exclude patients within the range of what is considered normal IOP (10–21 mm Hg). A change of >6 mm Hg from baseline was chosen based on previously published literature indicating that normal fluctuation of IOP is usually less than this value.16 Institutional Review Board approval was obtained for this study in concordance with the applicable rules at the University of Colorado Denver Health Sciences Center. Following data collection, the rates of IOP elevation, mean interval time between injections, median number of injections and mean ages were calculated for the entire population as well as all subgroups: bevacizumab only, ranibizumab only, bevacizumab and ranibizumab mixed, pre-existing glaucoma and centre-specific bevacizumab groups. The rates of IOP elevation were compared across subgroups using Fisher exact tests. The median number of injections and changes in IOP were compared using Mann–Whitney tests. The mean interval between injections was compared using unpaired t tests. A Kaplan–Meier survival curve was created to reflect the risk of sustained IOP elevation at different time intervals between injections (figure 1). Finally, odds ratios were calculated by comparing the rates of IOP elevation in various subgroups. 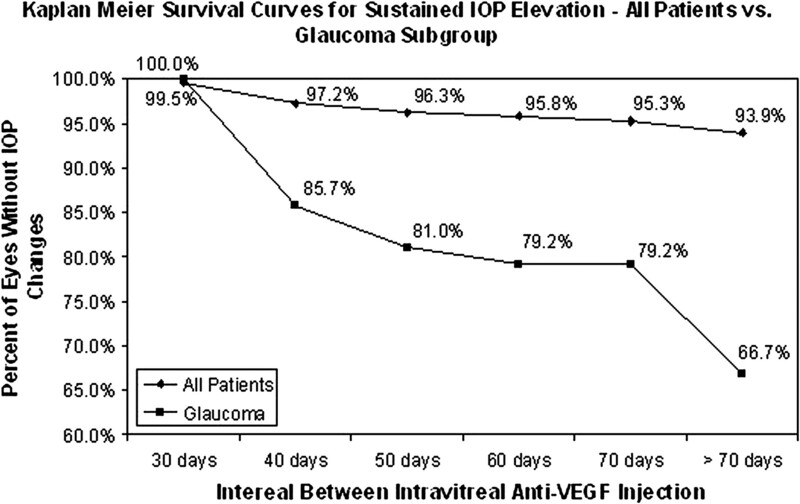 Kaplan–Meier survival curve for sustained intraocular pressure (IOP) elevation in all patients and glaucoma subgroup. VEGF, vascular endothelial growth factor. A total of 215 eyes from 195 patients were included in this study (table 1). The median number of total injections in this group was 9 (interquartile range 7.25–13) with a range of 1–30 and an average interval between injections of 70.2 days (SD=54.6). A total of 18 eyes in this group were found to have transient IOP elevation which resolved within 30 days without any intervention. Of the overall group of 215 eyes, 6% (n=13) of eyes were found to have sustained elevated IOP requiring physician intervention. Of note, there were no cases of bilateral IOP elevation in the 20 patients who received bilateral intravitreal injections. The median IOP change for the group with sustained IOP elevation was significantly higher than the IOP change in the rest of the population over the course of the study (12 and 0 respectively; p<0.001). The median number of injections prior to peak IOP for the 13 patients who developed sustained elevated IOP was 5 (interquartile range 3–7), which was lower than the median number of injections for eyes without sustained IOP elevation (9.5; p=0.002). The average interval between injections in these patients was 81.3 days (SD=48.3), which was similar to the interval between injections for eyes without sustained IOP elevation (69.5 days, SD=55.0; p=0.23). The average number of days from initial injection to peak IOP was calculated to be 487.8 days (SD=290.1). The median number of days between the last two injections prior to elevated IOP in these 13 patients was 49 days, which was not different from the median interval between injections for the eyes not experiencing sustained elevated IOP (54.8; p=0.19). The average peak IOP in the sustained elevated IOP group was 29.2 mm Hg with a range of 23–36 mm Hg. It should be noted that one patient had a documented IOP of 23 mm Hg which was indicated by the treating physician as being between the 22 and 24 mm Hg marks on the Goldmann tonometer. Medical interventions, both changes to current regimens as well as the addition of medications, were required in 12 patients, while one patient required laser trabeculoplasty (SLT). In the patient who underwent SLT, IOP decreased from 26 to 15 mm Hg and then increased back to 24 mm Hg 7 weeks later requiring medical therapy. All interventions were managed by glaucoma specialists, and with the exception of the patient requiring SLT, all medical interventions resulted in lowering IOP to acceptable levels. All patients with sustained IOP elevation remained on medical intervention at the completion of this study (figure 1). Pre-existing glaucoma diagnosis was found in 9.8% (n=21) of patients. All of these patients were seeing glaucoma specialists prior to receiving their first injection. The prevalence of increased IOP in this subgroup was 33% (n=7), which was higher than the overall rate of sustained IOP elevation using the Fisher exact test (p<0.001). The glaucoma subgroup had a lower median number of injections (6; interquartile range 5–10) compared with the non-glaucoma group (9.5; interquartile range 6–13.7; p=0.031). Eyes with glaucoma had a similar average interval in days between injections when compared with the 194 eyes without pre-existing glaucoma (67.8 vs 70.5 respectively; p=0.451). Six of seven glaucoma patients with increased IOP required changes to medication, and one required laser trabeculoplasty. One additional patient who experienced sustained IOP elevation had a pre-existing diagnosis of ocular hypertension (OHT) as noted by records obtained from the patient's glaucoma specialist. Of the total group of 215 eyes, 101 received bevacizumab, 96 received ranibizumab, and 18 received both bevacizumab and ranibizumab. In the bevacizumab subgroup, 9.9% (n=10) developed increased IOP, while only 3.1% (n=3) of the ranibizumab experienced increased IOP (table 2). The difference in incidence between the two subgroups was barely statistically significant (p=0.049) with an odds ratio of 3.4; in a post hoc analysis, however, the power of this difference was found to be only 0.037 at the 0.05 level, so we are unable to conclude if bevacizumab injections had a higher associated risk of sustained IOP elevation compared with ranibizumab. The bevacizumab and ranibizumab subgroups were matched in terms of age (76.6 vs 79.2 respectively; p=0.09). The ranibizumab group had fewer average days between injections compared with the bevacizumab group (56.3 vs 86.6 respectively; p<0.0001) and a higher median number of injections (12.0 vs 7.0 respectively; p<0.0001). A further analysis of the bevacizumab subgroup was conducted to determine any difference in prevalence of IOP elevations between the two retina centres used to recruit patients. This analysis revealed that nine of the 10 cases of increased IOP associated with bevacizumab injection were from one centre. The centre with more cases of elevated IOP had a rate of 15.3%, while the other centre had a rate of 2.4%. This difference in rates of IOP elevation was found to be statistically significant (p=0.031) with an odds ratio of 7.38. In comparing centres, the clinic with more IOP elevations had a similar median number of injections compared with the centre with less IOP elevations (8.0 vs 6.0 respectively; p=0.056) and longer average interval between injections (106.6 vs 57.9 days respectively; p<0.001). The reasons for our findings are not clear, though there are several potential mechanisms that could lead to elevated IOP after anti-VEGF agents. The two possible factors tested in this study were the total number of injections and the interval between injections, though the results of the study did not implicate either of these factors as causative for elevated IOP. In terms of total number of injections, more injections would theoretically lead to a more sustained level of higher concentrations of anti-VEGF proteins in the aqueous humour. There is some evidence that higher protein levels in the anterior chamber may be linked to IOP spikes, but this was in the setting of uveitis, and it remains unclear how this might relate to the current report.18 The other tested factor, interval between injections, assumes that a shorter interval would lead to accumulation of the injected agent and increased IOP. However, in the overall group, the 13 eyes which had sustained IOP increases had a statistically significant lower median number of injections and longer interval between injections, though this difference in interval was not statistically significant. Another mechanism that could account for this finding would be based on an immunological reaction postinjection, which has been documented with intravitreal bevacizumab injections.19 This immunological response could then potentially lead to subsequent IOP elevations related to inflammation;, however, all of the patients in this report had no signs of inflammation, and gonioscopic examinations were normal. Though our glaucoma subgroup was small (n=21), the prevalence of sustained IOP elevations in this group (33%) was relatively high and occurred after fewer median injections compared with non-glaucoma patients experiencing elevated IOP (5 vs 7.5 respectively; p=0.13). It is possible that eyes with an already compromised aqueous humour outflow system may be more prone to developing elevated IOP in this setting. It is important to emphasise that all patients noted to have elevated IOP in our study had a long documented history of stable IOP for several visits prior to beginning their anti-VEGF injection regimens. Beyond this, the IOP spikes were judged to be clinically significant by the treating retina and glaucoma specialists and were persistent for >30 days. The high mean IOP for eyes noted to have elevated pressures is an indication that natural fluctuations in eye pressure are not a likely explanation for the observed values. Our subgroup analysis comparing bevacizumab eyes at two independent retina centres shows a clear difference in the rate of IOP elevation (p=0.03). Upon closer examination of these data, one centre had a 2.4% rate of sustained IOP elevation, which is comparable with the overall ranibizumab subgroup (3.1%). This implies that the anti-VEGF protein itself might not be the cause of IOP elevation and raises the question of injection technique or other variables being responsible for the observed differences. Of interest, the two centres obtain their bevacizumab from different compounding pharmacies. The centre with the higher prevalence of IOP spikes obtained repackaged bevacizmuab from an outside compounding pharmacy, while the centre with fewer cases obtained bevacizumab in the original vial and repackaged the medication on site prior to injection. It is possible that transportation and storage of bevacizumb in plastic syringes could, over time, lead to aggregation of proteins and/or leaching of silicone from the syringe barrel and rubber stopper, both of which can then deposit in the trabecular meshwork leading to an increase in aqueous outflow facility. Recent work at our institution indicates that there are disparities in protein concentration as well as in concentration of large-molecular-weight compounds, likely representing silicone, in samples obtained from various compounding pharmacies.20 It is unclear how this might relate to our current findings. A recent review also found aggregated proteins to produce a more significant immunological response than non-aggregated proteins.21 In addition, there may be other currently unidentified factors which may have created the disparity in rate of IOP elevation between the two retina centres. These findings require further studies. The current study adds to and further validates data related to the growing number of cases of sustained elevation in IOP in patients receiving intravitreal anti-VEGF injection.11 12 14 It also highlights a possible association between the risk of elevated IOP and the source of bevacizumab injected, another area that should be further investigated to ensure proper standards for handling, storage and preparation of protein-based therapeutic agents. Physicians treating patients with anti-VEGF agents should be aware of these issues. Prospective studies investigating the phenomenon of sustained elevation in IOP postintravitreal injections of anti-VEGF agents are under way, and further in vitro testing of repackaged bevacizumab and commercial ranibizumab samples are being completed to help elucidate some of the factors leading to the findings of our study.
. Subfoveal fibrovascular membranes in age-related macular degeneration express vascular endothelial growth factor. Invest Ophthalmol Vis Sci 1996;37:1929–34.
. Role of vascular endothelial growth factor in ocular angiogenesis. Ophthalmol Clin North Am 2006;19:335–44.
. Introduction: understanding the role of angiogenesis and antiangiogenic agents in age-related macular degeneration. Ophthalmology 2009;116:S1–7. Package insert. Avastin (Bevacizumab). San Francisco: Genentech, 2004. Package insert. Lucentis (Ranibizumab). San Francisco: Genentech, 2006.
. Bevacizumab: an angiogenesis inhibitor with efficacy in colorectal and other malignancies. Ann Pharmacother 2004;38:1258–64.
. Antiangiogenic approaches to age-related macular degeneration today. Ophthalmology 2009;116:S15–23.
. Bevacizumab local complications. Ophthalmology 2009;116:2264.e1–3.
. Intravitreal bevacizumab causing acute glaucoma: an unreported complication. Eye 2007;21:1541.
. Persistent ocular hypertension following multiple intravitreal Anti-VEGF Injections for AMD. Invest Ophthalmol Vis Sci 2009;50:E-Abstract 959.
. Persistent ocular hypertension following intravitrea ranibizumab. Graefes Arch Clin Exp Ophthalmol 2008;246:955–8.
. Sustained elevation of intraocular pressure associated with intravitreal bevacizumab injections. Ophthalmic Surg Laser Imaging 2009;40:293–5.
. Avastin and risk of glaucoma [abstract]. New York: Retina Congress, 2009.
. The significance of the diurnal tension variations in normal and glaucomatous eyes. Arch Ophthalmol 1960;64:494–501.
. Risk of intravitreous injection: a comprehensive review. Retina 2004;24:676–98.
. Relationship between aqueous humor protein level and outflow facility in patients with uveitis. Invest Ophthalmol Vis Sci 2001;42:2584–8.
. Characteristics of severe intraocular inflammation following intravitreal injection of bevacizumab (Avastin). Br J Ophthalmol 2009;93:457–62.
. High-molecular-weight aggregates in repackaged bevacizumab. Retina 2010;30:887–92.
. Effects of protein aggregates: an immunologic perspective. AAPS J 2006;8:E501–7. Competing interests MYK, AEK and NM have received research support from Genentech in the past. Genentech had no involvement in this study nor with the preparation of this manuscript. Ethics approval Ethics approval was provided by the Institutional Review Board in concordance with the applicable rules at the University of Colorado Denver Health Sciences Center.